Another Truck Saved From The Crusher! Not long ago we were tooling down a highway and came upon this. 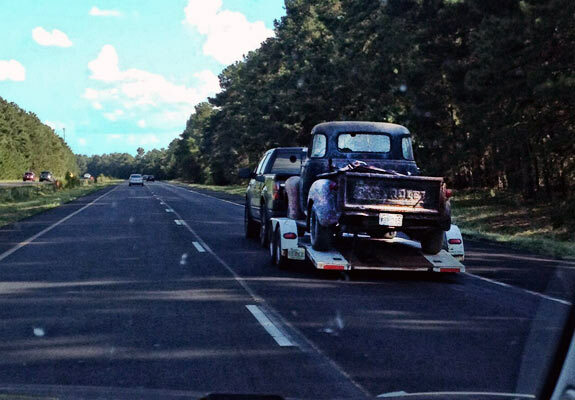 It is a Ford pick up truck with a trailer and on the trailer appears to be a 54 GMC barn find. We slowed down as long as possible to look at the old classic and then passed the truck noticing the two guys in the cab of the Ford smiling and laughing. That scene made my day complete. Somehow knowing these two gear heads found this old classic truck, rented a trailer and drove a good distance to get it on board and head home made me smile. I knew as well as they did that they had many more days, weeks, months ahead of them to get the new found classic on the road. It will take lots of money, busted knuckles, time tracking parts, and much more. But, these two guys saved another one from the crusher and for that – thumbs up. I wish I would have stumbled into them in a rest area so I could ask the obvious questions but I didn’t. So we have to use our imagination on what the plan was. Resto Mod it, hot rod it, restore it, or use it for parts for a donor truck. Either way it was good and we all like to see something that may be pointed toward the trash being brought back to life. I find this kinship wonderful and always think it is cool we have this bond. At a car show you walk up to a total stranger and start talking the talk. I have many new friends that I met this way and for all intent and purposes would have never met them any other way. If we can save an old car or truck from the crusher we all should be happier for it. When I was gainfully employed before my forced retirement I had a school bus account I worked with. One day they invited me over to watch them run a old bus through the crusher after the engine, trans, and seats were out of it. I took advantage of the offer and when that crusher grabbed that bumper and forced that big school bus into its claws we all stood as still as could be. It was amazing that this machine could swallow up an entire bus in mere minutes leaving nothing but scraps of metal behind to be recycled. Finally after years of this and prices of scrap metal at record lows they found a different way of ridding themselves of old school buses. Yes, they would drive and tow them to Mexico where they lived out there lives somewhere in South America. Today, the crusher is gone as it is no longer needed. Let’s not ever use either of these tactics on our golden classics. Advertise what you have, drag them out of the garage or barn and I will bet you will have two guys and a trailer at your place pretty darn fast. Related ItemsAnother Truck Saved From The Crusher!